People love chiptunes, and people also love Christmas. Mix them together and you've got yourself a new album to listen to this holiday season. Chiptunes are an ever growing genre of music, so much so that a chiptune Christmas album seems to come around every year. Last year it was 8-Bit Jesus by Doctor Octoroc (which is still worth downloading), and this year we get It's a Chiptune Holiday! by 8-bit Weapon and ComputeHer. Both albums have a different style, and can co-exist. While 8-Bit Jesus sounds like the soundtrack to a game about rescuing Santa, It's a Chiptune Holiday is more something that could be put on in the background while entertaining relatives you hate. Or, maybe to celebrate robot's first Christmas. 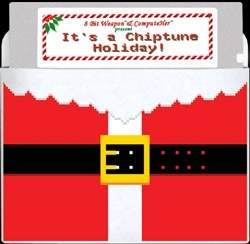 It's a Chiptune Holiday comes with eight tracks featuring covers of Joy to the World, Jingle Bells, and my personal favorite God Rest Ye Merry Gentlemen. The album is being sold on both 8-bit Weapon's and ComputeHer's websites for $9.95 with free worldwide shipping, and it comes in a CD case crafted out of an authentic 5.25" floppy diskette; the way we used to have to load up our videogames. The full album is available on IGN for free, but if you like it, supporting the creators wouldn't hurt.